A photographic identification guide to the 280 bird species most commonly seen in India. High quality photographs from one of India’s top nature photographers are accompanied by detailed species descriptions which include nomenclature, size, distribution, habits and habitat. The user-friendly introduction covers geography and climate, vegetation, opportunities for naturalists and the main sites for viewing the listed species. 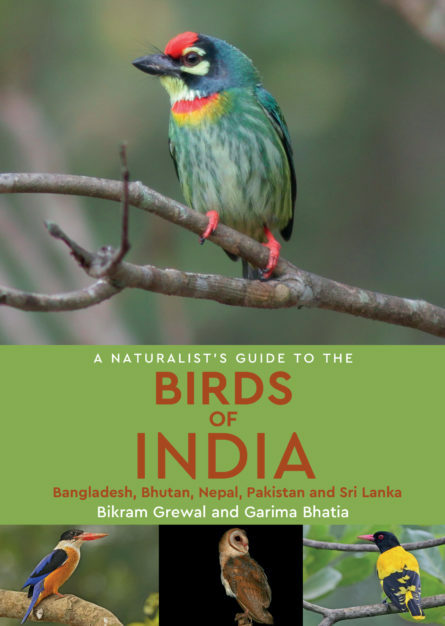 Also included is an all-important checklist of all of the birds of India encompassing, for each species, its common and scientific name as well as its vernacular name, its status in each state as well as its global IUCN status as at 2013. Bikram Grewel grew up in the dense evergreen forests of India’s north-east where he first developed his love for birds. He gave up his full-time publishing career to devote his time to the conservation of Indian wildlife, especially working on rare birds. He is the author of over ten books on birds of the subcontinent and also acts as a consultant on eco-tourism. He helped conceive the ‘birdsofindia’ website, now the biggest birding site in India and ranked amongst the top ten birding sites in the world. He is a trustee of the Wildlife Preservation Society of India (WPSI). He was awarded the Lifetime Award for spreading awareness about birds and conservation in India. A chemical engineer by training, Dr Garima Bhatia worked for a decade in automotive research before devoting her time to her passion for birdwatching. She has travelled extensively watching and photographing birds all over the Indian subcontinent, and her bird photographs have appeared in a number of international publications. She is also passionate about generating awareness about the environment. Born and brought up in India, she spent eight years in the US before moving to Bangalore where she currently lives.